Periodontal disease is one of the most common bacterial infections. It frequently leads to a substantial systemic antibody response and the release of inflammatory mediators. Locally, these events lead to inflammatory cell recruitment, connective tissue degradation and bone destruction. 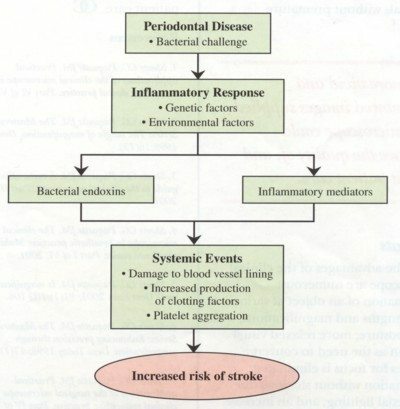 Systemically, studies now suggest that periodontal status may be an independent risk factor for stroke. Because of the high prevalence of dental disease, particularly among seniors associations with systemic outcomes are important. UP to 33 % of the elderly have Periodontitis, 40% are edentulous and 48 % have gingivitis. The first national, population based study of periodontal disease and cerebrovascular disease used data from the National Health and Nutrition Examination Survey, a study that examined almost 10,000 individuals.’ Compared to individuals with good oral hygiene, those with periodontal disease had twice the risk of suffering a stroke. This relationship was found to be true for men, women, blacks and whites. The increased risk was found only for non-hemorrhagic stroke. These strokes are caused by a loss of blood flow to the brain due to a blockage, rather than a burst vessel. Other smaller studies support this finding. Beck et at found a strong association between alveolar bone loss and stroke among a large cohort of veterans.’ Those with high levels of alveolar bone loss were almost three times more likely to suffer a stroke than patients with low levels of bone loss. Grau et at found that poor dental status resulting from chronic periodontal infection was associated with an increased risk of stroke.’ The relationship between periapical lesions and stroke appeared to be the strongest. Some studies, however, are less conclusive. This may be due in part to the difficulty of controlling for common risk factors such as smoking, stress and diet. A recent analysis of the data from the Physicians’ Health Study, an investigation of cancer and cardiovascular disease in over 2,500 American physicians, compared the relationship between reports of periodontal disease and the risk of cardiovascular disease .5 While the results showed an increase in the risk of stroke for patients with periodontal disease, the increase was not significant. Similarly, an analysis of the Nutrition Canada Survey results showed trends toward increased risk rates that were not significant. Bacteria may also attack the blood vessel lining and damage endothelial cells. Several periodontal pathogens can also induce platelet aggregation and promote vascular plaque formation that may eventually lead to blockage, clotting and thromboembolic events. Although it presently appears that periodontal disease and stroke are associated in some patients, further studies will be needed to support the possibility of a causal relationship. Joshipura K, Ritchie C, Douglass C. Strength of evidence linking oral conditions and systemic disease. Compend Cont Educ Dent 2000;21 (Suppl 30):12-23. Wu T Trevison M, Genco Rj, DornjP Falkner KL, Sempas CT Periodontal disease and risk of cerebrovascular disease: The first national health and nutrition examination survey and its follow-up study. Arch Int Med 2000;160(18):2749L2755. Beckj, Garcia Pt, Heiss G, Vokonas PS,Offenbacher S. Periodontal disease and cardiovascular disease. jPcYiodontol 1996;67.1123-1137. Grau Aj, Buggle F, Ziegler C, Schwartz W, Meuserj, Tasman A:f et at. Association between acute cerebrovascular ischemia and chronic and recurrent infection. Stroke 1997;28.1724-1729. Howell TH, Ridker PM, Ajani UA, Hennekens CH, Christen WG Periodontal disease and risk of subsequent cardiovasculardisease in U.S. male physicians. j Am Coll Card 2001;37(2):445-450.